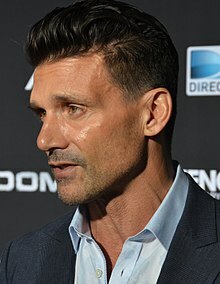 فرانک قریلو (اینگیلیسجه: Frank Grillo) آمریکالی اوْیونچو. ۸ ژوئن ۱۹۶۵ ‏ ایلینده نیویورک ایالتینده دۆنیایا گؤز آچیب. اؤز تحصیلینی نیویورک بیلیم‌یوردودا بیتیرمیش. 1992–گۆنوموز ایللر آراسیندا سینما ساحه‌سینده چالیشیب. 1993 Silk Stalkings Franco LaPuma Episode: "Ladies Night Out"
1996 Poltergeist: The Legacy Jerry Tate Episode: "Ghost in the Road"
2002 Law & Order: Special Victims Unit Frank Barbarossa Episode: "Deception"
2003 Karen Sisco Garrison Kick Episode: "Nostalgia"
2004 The District Vince Dymecki Episode: "Breath of Life"
2006 CSI: Crime Scene Investigation Gary Sinclair Episode: "Happenstance"
2007 Without a Trace Neil Rawlings Episode: "Tail Spin"
2007 Las Vegas Jeremy Shapiro Episode: "The Burning Bedouin"
2007 CSI: NY Jimmie Davis Episode: "The Thing About Heroes..."
2009 Law & Order: Special Victims Unit Mark Van Kuren Episode: "Transitions"
2011 Breakout Kings Agent Stoltz Episode: "Queen of Hearts"
اینگیلیسجه ویکی‌پدیاسی‌نین ایشلدنلری طرفیندن یارانمیش«Frank Grillo»، مقاله‌سیندن گؤتورولوبدور. ( ۲۲ ژانویه ۲۰۱۸ تاریخینده یوْخلانیلیبدیر). قارداش پروژه‌لرده فرانک قریلو گؤره داها آرتیق بیلگی‌لر تاپابیلرسینیز.